One of our most used hidden utilities within MAS90 and MAS200 is a program SVTRNA. What the program does is allow you to copy master data (no financial totals only names, descriptions, addresses) from the accounts payable, accounts receivable or inventory modules of an existing MAS90 or MAS200 company code into a brand new code. This is super helpful when establishing a new company within MAS that is virtually a mirror image of an existing one and which will make use of all (or virtually all) of the same customers, vendors or inventory. One of my 90 Minds Consulting Group colleagues just noticed that on version 4.4 product update 5 that when he copied over inventory data he was also receiving a little more than he bargained for. Normally only the master information for each inventory item would copy (description, product line, etc). It appears there may be a bug in v4.4 product update 5 which results in some totals (quantities on hand) also transferring if you use the SVTRNA utility. This isn’t a huge issue – except according to my colleague there’s no way to fix the totals by using the Visual Integrator module. So if you’ve made a data transfer using SVTRNA into inventory and hadn’t thought to keep a backup – you could find yourself in a bit of a pickle. Your best bet when making copies of data is to always make a complete backup of your MAS data BEFORE attempting the transfer (here’s one way that Sage recommends). We’ll update you with more information on this as we hear about it. Have a quick question about Sage ERP MAS 90 or MAS 200 (as well as Epicor, Sage ABRA, Sage Accpac, Sage MAS 90, Sage MAS 200, Sage MAS 500, SageCRM, SAP Business One, Microsoft Dynamics, Navision, SAP, Open Systems or Traverse) – visit the new question and answer site founded by the 90 Minds Consulting Group. The group formed in 2005 and monthly shared in excess of 500 messages between members who provide feedback to each other on support issues around the products that they work with. Now that shared knowledge is available to you — at no cost. The web site — Ask90Minds accepts questions from any user on the web (you can login by creating an account, using your Facebook login or using a Twitter login). To ask a question simply navigate to the http://www.ask90minds.com home page. Ask your question and it will instantly be sent to the 90 Minds Consulting Groups internal communication system (Socialcast) via RSS feed. 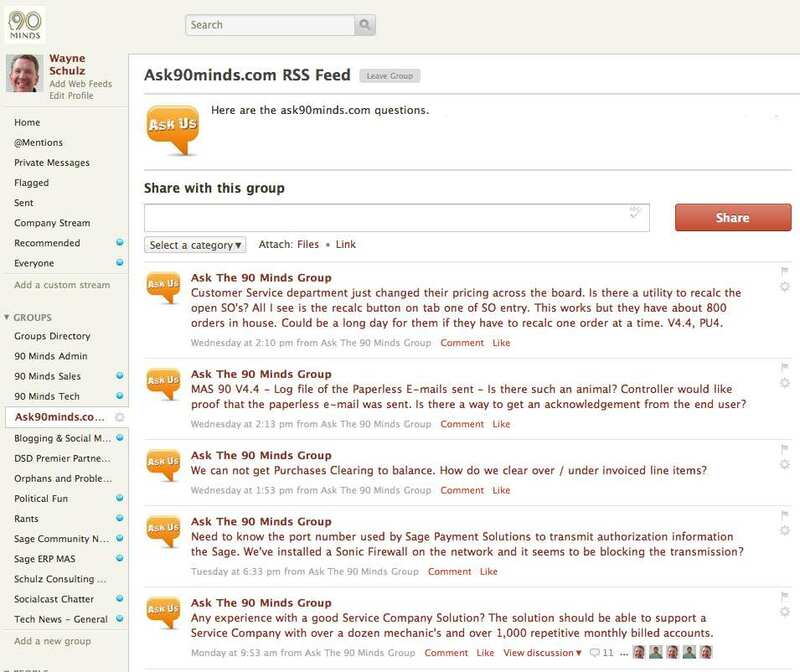 Here all of the 90 Minds members are immediately notified of every question that is submitted on the Ask90Minds site. 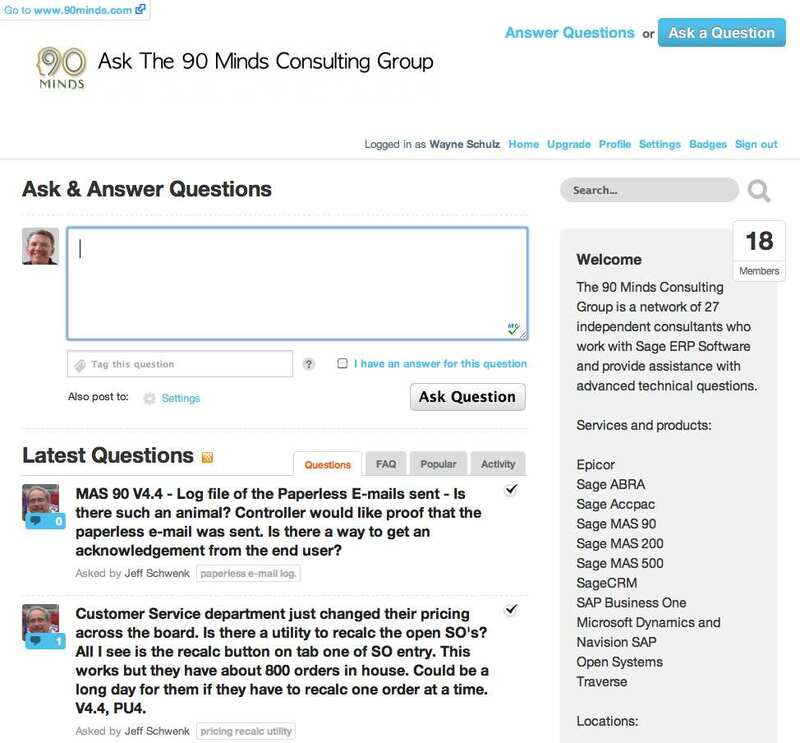 The next time you have a quick ERP question – give the Ask90 Minds site a try. UPDATE 5-4-2009: In a highly unusual (and unfair) move Sage today voided all quotes issued for this promotion. There was no advance warning save for a 5 pm email. Worth noting that Sage had AGGRESSIVELY promoted this to their end users both by recommending that their Business Partners offer the deal and also by direct calls out to qualifying MAS 90 and MAS 200 users. Due to the low cost involve – the pricing was met by numerous inquiries from VARS as to “whether it was right”. Therefore any outstanding quotes by Sage have been voided. We find this practice unfair and unusual. Sage Here’s a promotion from Sage that expires June 30, 2008 that’s left a good number of resellers scratching their heads and muttering “wow, this seems too good to be true”. Several people in my 90Minds Consulting group have been talking about this upgrade offer that Sage current has on the table. The offer applies specifically to a class of MAS 90 or MAS 200 users who are referred to as “grandfathered”. These users purchased MAS 90 or MAS 200 prior to October 1, 2003. During this time Sage was not charging annual maintenance on user licenses so the users have not be subject to any per user license fees. The offer is as follows. Grandfathered users can upgrade to the Sage Extended Enterprise Suite (comprised of MAS 90 or MAS 200 + SageCRM + Sage FAS) for a one time license transfer fee of $500 per user. Their maintenance for each user will be only $150 per year – which in nearly every instance is a huge savings over what the company would have been paying previously. Subject: [sageresellers] New Pricing on Grandfathered accounts for EES? Basically the new maintenance fee for all grandfathered accounts is $150 per user (MAS 90, not sure what MAS 200 will be). This means a company currently grandfathered and owning a 5 user MAS 90 license for core and distribution is probably paying about $2,000 or so for annual maintenance. With this promotion, they can move to EES ($2,500 one time migration fee) and their annual maintenance changes to $150 per user or $750! This means that for roughly an extra $1,200 this year ($3,250 vs the 2,000 they would have paid for maintenance on their current license) they get CRM, and they will get that $1,200 back in Year 2 in reduced maintenance. Starting in year 3 they are saving $1,200 every year and they get to keep CRM. EES maintenance for a 5 user MAS 90 migration had previously been somewhere just over $2,100 annually, so at $750 it represents a decrease of over $1,300! If it were a 10 user grandfathered, the EES maintenance had been over $4,100, now it is only going to be $1,500, a savings every year of over $2,500 – forever! This was such an outrageous difference and so un-Sage like that I specifically said that clearly this $150/user charge must only apply to users after the first 5, but I was told specifically no, it applies to all! The catch is that if they add licenses at anytime, the maintenance on those licenses are at normal maintenance pricing. I have asked for this in writing before we start quoting, but was curious if anyone else has had this conversation with someone at Sage? My first reaction was that this offer was too good to be true and that there must be a mistake somewhere. 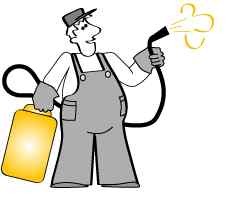 But then two more consultants replied that they’d been offered the exact same promotion and it was explained in the same manner. Sage’s followup explanation to the promotion seems to confirm that users who owned MAS 90 or MAS 200 prior to 10/1/2003 can probably save quite a bit of money by upgrading to Sage Extended Enterprise. This upgrade requires no data conversion and until you implement the SageCRM or SageFAS there’s no retraining. 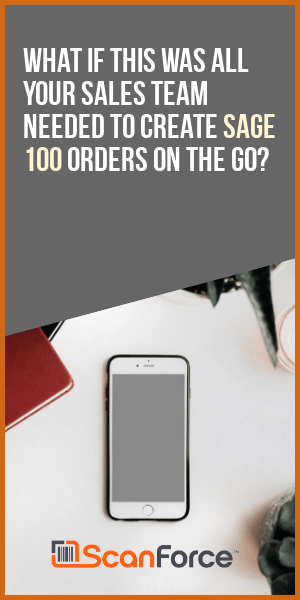 Every MAS 90 or MAS 200 customer who qualifies should be looking into this promotion and talking to their Sage Business Partner about the promotion. 1. Reduce your current annual maintenance and enjoy additional modules and features! 2. Manage your business more effectively with a complete 360 degree view of your business! 3. Streamline costs and enhance customer relationships with full CRM functionality! This promotion would apply to Sage MAS 90 and 200 customers who purchased their system prior to October 1, 2003, and are currently on a “Grandfathered” status. Please note: the $150 per user fee applies to existing users only. Standard EES maintenance rates will apply to new add-on users. The promotion does not include maintenance on modules and extended solutions outside the EES product suite. In addition, we have added more dates to our webcast schedule, so please encourage your customers to register for our live Extended Enterprise suite webcasts! Sage North America has created an official Twitter account (http://www.twitter.com/insights09) for their upcoming Insights 2009 reseller conference held May 11-14, 2009 in Nashville TN. Twitter is a short messaging (maximum of 140 characters) service that allows users to casually communicate with each other – usually in the form of brief updates that tell what the user is doing. The short message feature is ideal for conferences where it’s often difficult to find people or learn about newly added sessions other users recommend attending. If you’re not on Twitter (which is free) – you can still read the messages coming from the conference. There are two methods for doing this – and neither require that you create an account. 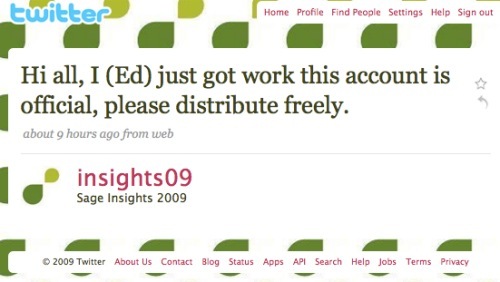 The best way to follow the conference is by using this #insights09 Twitter Search link.